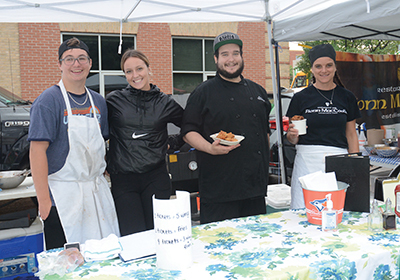 It was a chicken wing lover's dream during the Great KINadian Wing Fling held at Alexandria Park in Orangeville last Saturday, August 25. Sponsored by the KIN Club of Orangeville, the event brought local restaurants to the park to give visitors a taste of their unique brand of wings. At one time, chicken wings were the pieces that meat cutters and grocery stores tried to pawn off to customers as inexpensive items that most people avoided. Thanks to a late night party at the Anchor Bar in Buffalo, New York, in which the bar owner threw some chicken wings into a deep fryer and then covered in barbecue sauce to give a snack to her son and some friends, a new menu item was born. Because of the popularity at the Anchor Bar, other restaurants started serving wings around Western New York and the Niagara Region in Ontario. Turns out deep fried chicken wings are pretty tasty. From there the trend spread across the continent with restaurants coming up with new flavours all the time. Whether you like yours in a mild barbecue sauce or dripping with the extreme suicide, ultra-hot, variation, local restaurants have some of the best wings in the region. The concept of a local Wing Fling came from KIN Club member Geoff Del Grande who thought it would be a way for the local group to raise funds for their local projects. Local auto dealers purchased picnic tables for the event with all the tables going back to local parks. Parker Mitsubishi, Hallmark Toyota, and Orangeville Honda purchased the tables. “All the wing makers are local. We have Stompin Grounds, BVR, the Hatter, Fionn MacCool's and the Mill Creek Pub here,” Ms. Lockhurst said. The day also featured an open mic session in the gazebo where local musicians could sign up and take the stage. Visitors could vote on their favourite wings with the winner claiming the ‘people's choice' award. The KIN Club is planning on making the Wing Fling and annual event in Orangeville.